The traditional dawn of summer here in Florida brings with it the dawn of storm season, a months-long period in which heavy afternoon thunderstorms are the norm and conditions are ripe for the development of tropical storms and hurricanes. Gusty winds, lightning strikes and flash floods are among the most common byproducts of these intense summer storms. But so too are rip currents. That’s why the American Red Cross always chooses the first week of June as Rip Current Awareness Week. The National Weather Service defines rip currents as “strong narrow currents that move away from shore.” They can occur at any beach where there are breaking waves, and they are often swift enough to drag away even the strongest of swimmers. 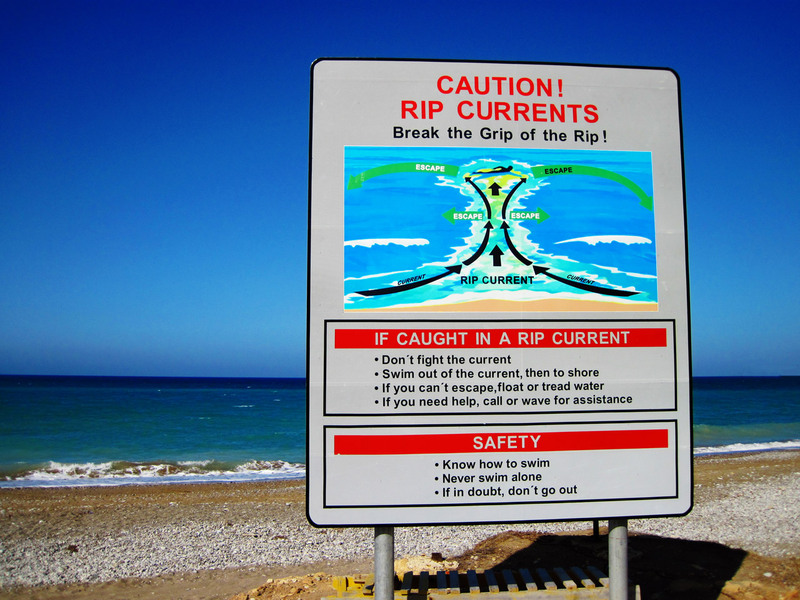 Studies show that rip currents have at times attained speeds of eight feet per second. That’s faster than Olympic swimmers can swim and in terms of danger, they are a greater menace to swimmers than tornadoes are to non-swimmers. Since 2013, when the National Weather Service first began keeping data on them, rip currents have been responsible for an average of 65 deaths per year, which is more than the number of deaths reportedly caused by tornadoes and lightning strikes over that period. In addition, the United States Lifesaving Association says that rip currents are the reason for 80 percent of all beach rescues in the United States, where the NWS says Florida ranks first in rip-current related deaths the past four years. 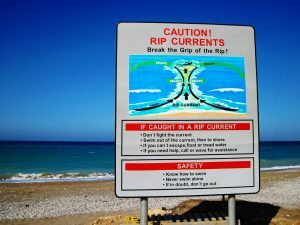 Rip currents are known to have a quick-sand-like effect on their victims as disaster often strikes as a result of a swimmer attempting to swim back towards the shore, against the stronger pull of the outward-bound current. That’s a natural instinct, but swimming into the current will quickly tire out even the best of swimmers, which can result in drowning. It’s recommended then that swimmers caught in a rip current instead swim parallel to the shore line until they reach the end of the current. For more tips on how to survive being caught in a rip current, check out this safety video courtesy of the American Red Cross. And keep in mind that a wicked storm doesn’t have to be immediately present to create a rip current. Storms that are well offshore can produce rip currents as well, which is why it’s wise to always keep track of local weather conditions, including checking the NWS’s rip current forecast, before heading out to the beach.